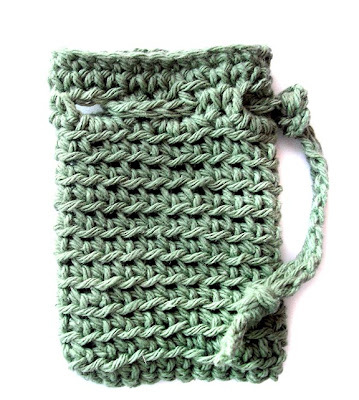 This soap saver is perfect for holding bar soap, recycling small soap pieces, and for using up leftover yarn scraps. It will save you a little money as well. It is crocheted in the round from the top down. 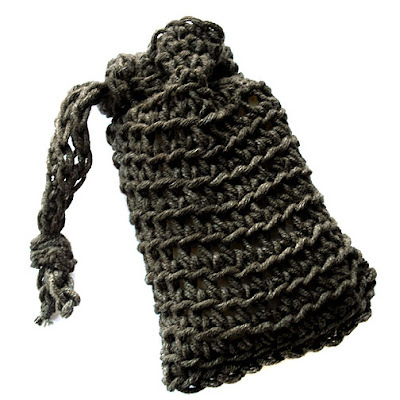 The drawstring is crocheted separately, and then woven through the holes in the top of the pouch. 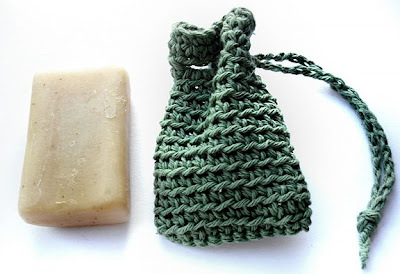 You can use the drawstring to hang the soap saver in your bathroom. 1. CH 24, SL to join into a ring. 5. SC into the back loop of each stitch for 10 rounds. This creates a very elastic fabric that will stretch to fit most normal sized soaps. 6. To close the bottom of the bag, lay the bag flat and SC through both sides of the bag. Pull the yarn through the last stitch to create a knot and weave in the ends. 7. To create the drawstring, CH until you have a length of about 12 inches. Pull end of yarn through the last stitch to make a knot. This is your drawstring. Weave it through the spaces created by the chain stitches in the 3rd step. Tie a knot at the end to form a loop, insert your soap or soap pieces, and tie another knot to secure it. Thanks for the comments you left on my blog. I appreciate it! Thanks - this was so fast and easy. I am going to make one for my Zune next. I just wanted to thank you for this pattern. It was super easy and quick. All the ones I have found online are so complicated! Thanks again! That made up beautifully! Thank you! I have limited experience with crocheting, and tried this pattern without success. After several attempts I quit, and went on to another project. Each time I tried to join the chain (first step), I ended up creating a Mobius strip. Is there any chance you can clarify how to correctly join the ends of the chain to form a circle without a twist in it. I'd really like to make this, but I'm just too frustrated. I have a question, on round 4, you say to sc 3 in each ch 2 space? Shouldn't that be sc 2 in each ch2 space? With the 3 sc in each space, my bag gets bigger at the sides instead of having straight sides. Can you please help me? Thanks!